You can never have too many easy dinner recipes as a go-to for the week. 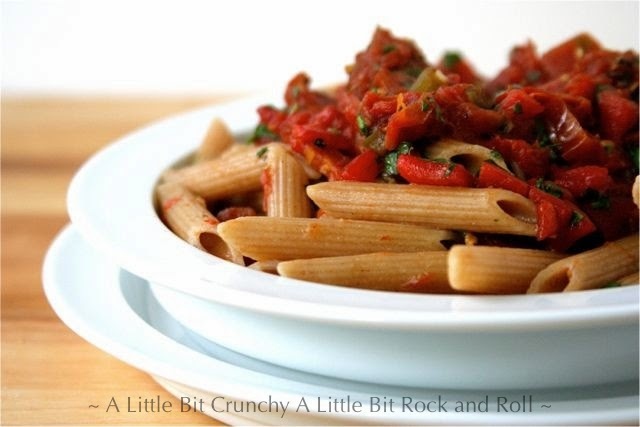 This Simple Sun-dried Tomato Pasta is a must to add to your easy pasta recipes list. Serve with a salad and a side of "Easy" Garlic Toast for a meal your whole family will love. 1. In a 12-inch skillet, heat the olive oil and garlic together. When the garlic becomes fragrant, add the crushed red pepper flakes and roasted red pepper. 2. Add the can of tomatoes (including the liquid) crushing the tomatoes in your hands to break into pieces. 3. Add the sugar, salt, pepper, and sun-dried tomatoes. Simmer for about 10 minutes. 4. Off heat, add the balsamic vinegar and parsley. Toss the tomato sauce with the pasta. *To roast a red pepper: Place the pepper in a hot oven on a sheet pan until all the sides are black and charred. Or, place the pepper directly on the flame of a gas stovetop. Rotate until all the sides are charred. Place the pepper in a brown paper bag for 10 minutes to all it to steam. Remove the black charred skin. Do NOT rinse the pepper under water- this removes flavor.